Guolin Qigong is a combination of meditation, controlled breathing and physical movement designed to control the vital energy (qi) of the body and consequently to improve spiritual, physical and mental health. Practice of Qigong has been reported to alter immunological function, but there have been few studies of its effects on cytokines, the key regulators of immunity. Numbers of peripheral blood cytokine-secreting cells were determined by ELISPOT in 19 healthy volunteers aged 27 – 55, before they were taught the practice of Qigong and after 3, 7 and 14 weeks of daily practice. The effect of Qigong on blood cortisol was also examined. Numbers of IL4 and IL12-secreting cells remained stable. IL6 increased at 7 weeks and TNFα increased in unstimulated cultures at 3 and 7 weeks but decreased at these times in LPS and SAC-stimulated cultures. Of particular interest, IFNγ-secreting cells increased and IL10-secreting cells decreased in PHA-stimulated cultures, resulting in significant increases in the IFNγ:IL10 ratio. Cortisol, a known inhibitor of type 1 cytokine production, was reduced by practicing Qigong. These preliminary studies in healthy subjects, although not necessarily representative of a randomized healthy population and not including a separate control group, have indicated that blood levels of the stress-related hormone cortisol may be lowered by short-term practice of Qigong and that there are concomitant changes in numbers of cytokine-secreting cells. Further studies of the effect of Qigong in patients with clinical diseases known to be associated with type 2 cytokine predominance are merited. Qigong is a combination of meditation, physical movements and controlled breathing. These exercises are designed to develop the skill of controlling qi, the vital energy of the body, and consequently to improve spiritual, physical and mental health. Adepts can reportedly use emitted qi to alter the performance of cells: "facilitating qi" increases cell growth while "inhibiting qi" suppresses growth of cultured tumour cells . Guolin Qigong was introduced more than 50 years ago by Madam Guo, a long-term cancer survivor who developed a network of self-help groups throughout China and beyond. This form of Qigong, which is characterized by a slow walking exercise accompanied by arm movements coordinated with slight twisting movements of the waist, is said to be particularly helpful for cancer patients. Among the organs apparently affected by qigong are brain, heart, kidney and the immune system, with benefits being reported in senility, hypertension, stroke, asthma, blood chemistry and cancer [2–6]. (See also http://www.goldenflower.org/reflib/articles/tc_as_treatment.shtml). Cytokines are highly labile effector glycoproteins which are crucially involved in afferent and efferent limbs of immune responses as pro-inflammatory and anti-inflammatory regulators. Type 1 cytokines, such as interferon-gamma (IFNγ), tumour necrosis factor alpha (TNFα) and interleukin (IL) 12, promote cell-mediated responses, while type 2 cytokines, including IL4, IL6 and IL10, are anti-inflammatory and favour humoral responses [11, 12]. Cell-mediated responses are important in protection against cancers, while overproduction of anti-inflammatory cytokines is potentially suppressive for anti-cancer immunity. The present pilot study was designed to investigate effects of Qigong on in vitro cytokine production in healthy volunteers and to determine whether further evaluation of its effects on the cytokine profiles of patients with cancer would be valuable. We measured production of the above 6 cytokines before Qigong training and for up to 14 weeks of performing the exercises. Significant increases in PHA-stimulated IFNγ:IL10 ratios were found, indicating a shift towards cytokines favoring cell-mediated immunity. Nineteen healthy Chinese subjects aged 27 – 55 years (mean 43.9 ± 7.8), of whom 11 were females, were recruited by advertisement for first-time training in Guolin Qigong. One further volunteer was excluded on the grounds of ill-health. Each subject attended six 2-hour Qigong class in a two week period. They then practiced the exercises every day and kept diaries to record details. Ten subjects were still practicing Qigong at the end of the study period (14 weeks from starting training), while 9 ceased practice at 10 weeks. Blood pressure, pulse rate, blood cortisol level and production of IFNγ, IL4, IL6, IL10, IL12 and TNFα were measured before training and after 3, 7 and 14 weeks. One subject was excluded from the main study because of respiratory infection at 3 weeks, but was included in the 14 week comparison of subjects who completed the study with those who stopped, as the infection had cleared at that time. Numbers of cytokine-secreting cells (CK-SC) in unstimulated cultures or cultures stimulated with T-cell activators phytohaemagglutinin (PHA), Concanavalin A (Con A) or solid-phase anti-CD3, or monocyte activators E. coli lipopolyssacharide (LPS) or S. aureus Cowan I (SAC) were determined using ELISPOT assays [13, 14]. Details of our adaptation of this method and its specificity and reproducibility have been reported [15–17]. Briefly, heparinized blood was processed for cytokine evaluations within one hour of collection. Peripheral blood mononuclear cells (PBM) were separated over Lymphoprep (Nycomed, Oslo, Norway) and added to 96-well Multiscreen plates (Millipore, Bedford, MA, USA) which had previously been coated with cytokine capture antibodies (Pharmingen, San Diego, CA, USA) and blocked with 5% fetal calf serum (FCS) in medium RPMI 1640. Duplicate cultures of 104 (for IL6 and TNFα) or 105 (for IFNγ, IL4, IL10 and IL12) cells/well in RPMI + 5% FCS with or without stimulators were incubated for 18–22 hours at 37°C in 5% CO2. Cells were then washed out and plates incubated sequentially with biotinylated detection anti-cytokine antibodies (Pharmingen), streptavidin-alkaline phosphatase (Sigma, St. Louis, MO, USA) and 5-bromo-4-chloro-3-indolylphosphate-nitroblue tetrazolium (Calbiochem, La Jolla, CA, USA). Blue spots corresponding to each cytokine-SC were counted by microscopy with the aid of eyepiece graticules covering 1/8 or 1/72 of the culture well area. Results are expressed as CK-SC/106 PBM. Prism version 2.0 software (GraphPad, San Diego, CA, USA) was used to compare various parameters before and at 3, 7 and 14 weeks after starting training (paired t-test) and to compare results at 14 weeks for subjects who stopped performing Qigong at 10 weeks with those of subjects who continued beyond 14 weeks (unpaired t-test). No significant changes in systolic or diastolic blood pressure occurred over the study period, but pulse rate decreased from 76.3 ± 11.4 (mean ± SD) before training to 69.8 ± 9.4 at 3 weeks (p<0.05). However, values at 7 and 14 weeks (71.4 ± 9.5 and 74.3 ± 13.3 respectively) were not significantly different from baseline. Plasma cortisol levels at baseline were 394 ± 115 nmol/l and at 3, 7 and 14 weeks were 328 ± 126 (p < 0.05), 376 ± 109 (not significant) and 318 ± 110 (p < 0.05) respectively. Numbers of PHA, anti-CD3 and Con A-stimulated IL4-SC (Fig. 1A) and unstimulated and PHA, anti-CD3 and SAC stimulated IL12-SC (Fig. 1B) remained stable before and after Qigong training. No IL4 (nor IFNγ)-SC were seen in unstimulated cultures, as observed previously [15–17]. Numbers of IL4 (A) and IL12 (B) cytokine-secreting cells (CK-SC) per 106 peripheral blood mononuclear cells (PBM) measured by ELISPOT assay in 19 healthy volunteers before starting Qigong training (P) and after 3, 7 and 14 weeks of practice. There were no significant changes during the study period. IL6-SC were significantly increased after 7 weeks of exercising in unstimulated, PHA-stimulated and LPS-, but not SAC-, stimulated cultures and returned to baseline levels at week 14 (Fig. 2A). TNFα-SC were significantly increased at 3 and 7 weeks in unstimulated cultures and returned to near baseline at 14 weeks. There was no significant increase in TNFα-SC stimulated by T-cell or monocyte activators and in fact LPS and SAC-stimulated TNFα-SC were significantly reduced at 14 weeks compared to pretraining (Fig. 2B). Numbers of IL6-SC/106 PBM were increased after 7 weeks of Qigong practice compared with pretraining (A). 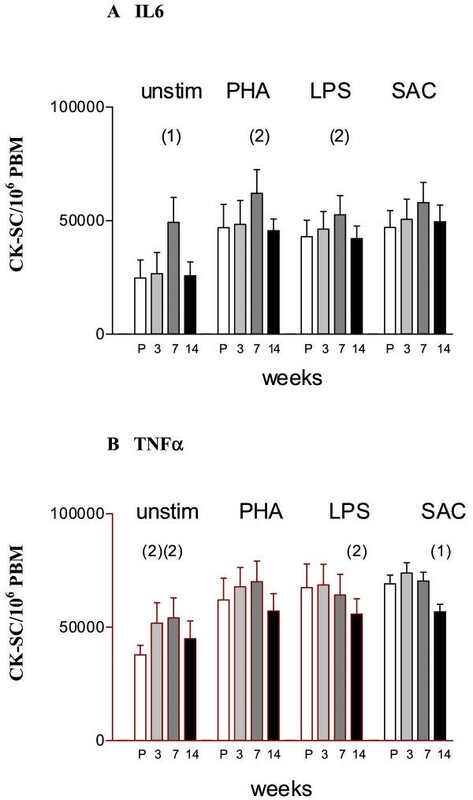 Numbers of unstimulated TNFα-SC/106 PBM were increased at 3 and 7 weeks, but LPS and SAC-stimulated TNFα-SC/106 PBM were decreased at 14 weeks compared to pretraining (B). (1) p < 0.01, (2) p < 0.05 compared with P, paired t-test. Reduction in IL6 and TNFα-SC between week 7 and week 14 could have been because approximately half of the subjects stopped exercising at 10 weeks. This was not so for IL6, since cytokine production was similar in those who continued and those who stopped performing Qigong (Fig. 3A). In contrast, stopping Qigong was associated with a significantly lower level of unstimulated and PHA-stimulated TNFα-SC than in those who continued (Fig. 3B). Numbers of IL6-SC/106 PBM (A) and TNFα-SC/106 PBM (B) at 14 weeks in subjects who continued (C) Qigong practice beyond 14 weeks and those who stopped (S) at 10 weeks. (1) p < 0.05, unpaired t-test. IFNγ-SC were significantly increased in PHA-stimulated cultures at 3, 7 and 14 weeks. The more powerful IFNγ inducers Con A and anti-CD3 stimulated levels of cytokine production that were less influenced by practicing Qigong, only Con A-induced IFNγ-SC at 3 weeks being significantly higher than before training (Fig. 4A). IL10 production in unstimulated cultures increased significantly after 7 weeks of exercises but fell back to pretraining levels at 14 weeks. 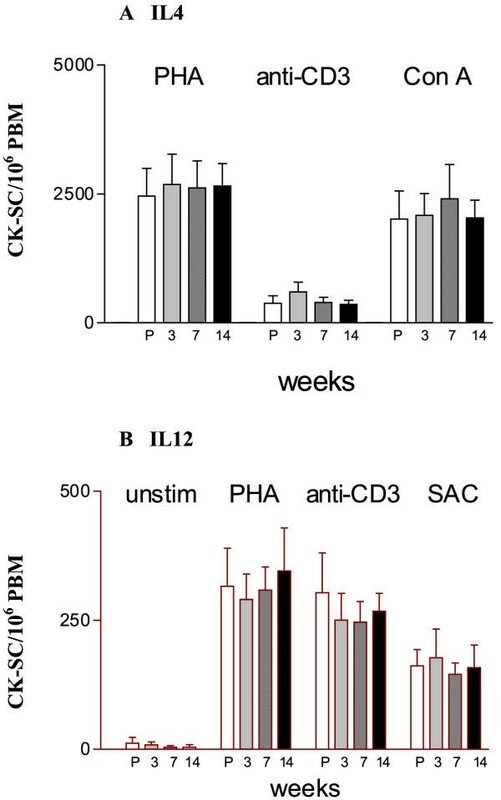 PHA, LPS and SAC-induced IL10-SC were similar to pretraining levels at weeks 3 and 7 and lower at week 14, with PHA-induced IL10-SC being significantly lower than before training (Fig. 4B). The ratio of IFNγ:IL10-SC in PHA-stimulated cultures was significantly higher at 3, 7 and 14 weeks than before training (Fig. 4C). Increased numbers of PHA-induced IFNγ-SC/106 PBM at 3 – 14 weeks of Qigong practice and of Con A-induced IFNγ-SC/106 PBM at 3 weeks compared with pretraining (A). Increased numbers of unstimulated IL10-SC/106 PBM at 7 weeks and decreased numbers of PHA-stimulated IL10-SC/106 PBM at 14 weeks (B). The ratio of PHA-induced IFNγ : IL10 increased with duration of Qigong practice (C). (1)p < 0.01, (2) p < 0.05, (3) p < 0.001 compared with P, paired t-test. IFNγ-SC, IL10-SC and the ratio of PHA-stimulated IFNγ:IL10-SC at 14 weeks were not significantly different in subjects who stopped performing Qigong exercises at 10 weeks compared with those who continued beyond 14 weeks (Fig. 5). IFNγ production (A), IL10 production (B) and IFNγ:IL10 ratio (C) at 14 weeks after training in subjects who continued (C) Qigong practice beyond 14 weeks and those who stopped (S) at 10 weeks. Qigong has been practiced for over 3,000 years in China and evidence of its beneficial effects in maintaining and improving health has been presented, though largely in journals inaccessible to the West. Wider application of Qigong could possibly contribute to a healthier population less dependent on modem medicines, the cost of which is spiraling. If it were possible to identify the precise mechanisms by which Qigong achieves these supposed benefits, more focused application of the exercises and of qi energy could possibly result in generally acceptable therapies to supplement current practices. The present study attempted to determine whether the key regulator molecules of the immune system, cytokines, are influenced by Qigong. I chose to evaluate cytokine production using ELISPOT assays because these measure actual secreted cytokine rather than intracytoplasmic protein (as measured by flow cytometry) or message (by reverse transcriptase polymerase chain reaction) and the problem of cytokine neutralization by concomitantly secreted antagonists or soluble receptors, which affects measurement of cytokines in culture supernatants, is avoided. The ELISPOT assays established in our laboratory are sensitive, specific (no ELISPOTs develop when unmatched pairs of anti-cytokine antibodies are used for capture and detection) and reproducible, with intra-assay coefficients of variation (CV) of 8.8 ± 5.8% for combined data for IFNγ, TNFα, IL4, IL6, IL10 and IL12 and all stimuli . Inter-assay variation is 13.2 ± 4.9%, reflecting considerable individual day-to-day variation, but when groups of subjects are evaluated at different time points, mean values vary by only 5.3 ± 3.8% . This is acceptable for studying effects of interventions in groups of subjects. All recruited volunteers were normotensive before training and practicing Guolin Qigong for at least 10 weeks did not alter blood pressure greatly. Pulse rates were lower than baseline at 3 weeks but not at 7 or 14 weeks. Interestingly, reduction in cortisol levels was biphasic, with a return to pretraining levels at 7 weeks despite significant reductions at 3 and 14 weeks. There were no significant differences between cortisol levels in those who stopped exercising at 10 weeks and those who continued. It is possible that practicing Qigong improved the stress-coping skills of our volunteers and that this ability was retained even after exercising was discontinued. This possibility requires further study. Previous studies have shown that in vitro production of IFNγ, IL12 and TNFα is suppressed by cortisol and that these cytokines are negatively correlated with plasma cortisol levels . Administration of cortisone acetate decreases the IFNγ:IL10 ratio by >70% . Improved coping with stress might therefore be expected to lower cortisol and favour type 1 over type 2 cytokine production. Our subjects had significantly increased IFNγ and reduced IL10-SC in PHA-stimulated cultures after practicing Qigong for as little as 3 weeks, with even greater increases at 14 weeks. This effect was still seen at 14 weeks in subjects who stopped exercising at 10 weeks. However, polarization towards type 1 responses was not found with all in vitro stimuli. Increases in IFNγ production after Qigong training were less apparent when Con A or solid-phase anti-CD3 were used. IL10 production was increased rather than decreased at 7 weeks in unstimulated cultures and there was only a trend towards reduced LPS or SAC-induced IL10 at 14 weeks. Furthermore there were no noticeable effects of Qigong on IL12, the key inducer of IFNγ and type 1 cytokines , nor on IL4, the central player in type 2 responses . Unstimulated and stimulated IL6-SC were significantly increased at 7 weeks, suggesting that a transient inflammatory event may have occurred at this time. Cortisol levels had risen from the reduced levels seen at 3 weeks and were to fall again at 14 weeks, which might indicate an increase in stress level of unknown causation at this time. However, DeRijk et al found that physiological increased levels of cortisol induced by strenuous exercise had no effect on LPS-induced IL6, and pharmacologically increased levels were suppressive. TNFα-SC increased over baseline in unstimulated cultures at 3 and 7 weeks and fell back to normal at 14 weeks in subjects who stopped performing exercises at 10 weeks. There was a similar but not significant trend in PHA-stimulated cultures, whereas in cultures stimulated with monocyte activators TNFα levels were suppressed at 14 weeks even in subjects who stopped exercising at 10 weeks. 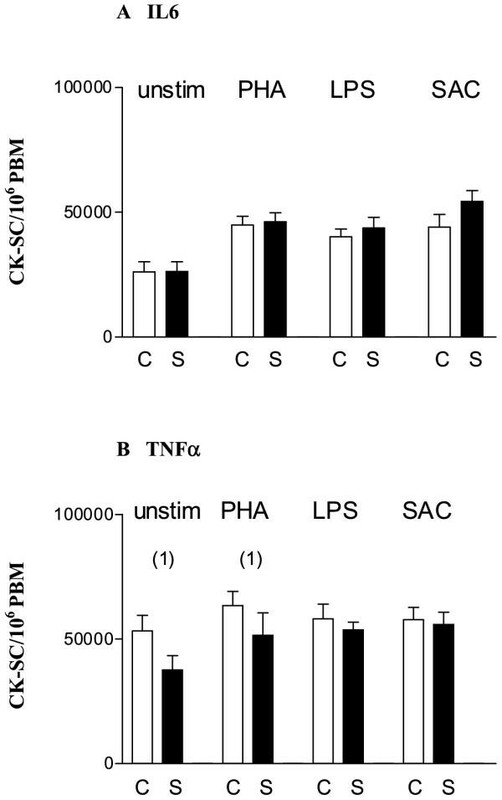 Unlike IL6, TNFα is sensitive to suppression by physiologically-induced increases in cortisol  but our results suggest that if the changes in TNFα seen in this study were due to fluctuating cortisol levels then TNFα induction by T-cell activators and in vivo stimuli may be affected by cortisol in a different way to that induced by monocyte activators. A balance between type 1 and type 2 cytokines is required for maintenance of health, a preponderance of the former being associated with certain organ-specific autoimmune diseases and of the latter with allergy, systemic autoimmunity and suppressed responses to viruses and cancer . Preliminary evidence from a small, non-randomized, uncontrolled study has been provided here that Guolin Qigong might alter cytokine production in healthy subjects in the direction of type 1 responses. There is no evidence at present to indicate whether this would be beneficial, leading to stronger protection against, for example, cancer and asthma; harmful, leading to later complications such as autoimmune disease; or without effect, due to the relatively minor changes induced. Further studies of the effects of Qigong, and of the various components of Qigong, on clinical, immunological and physiological parameters in various disease situations are, however, clearly merited. This study was initiated by Dr Vivian Wong, Hospital Chief Executive, Queen Mary Hospital, and was supported by the Li Ka Shing Foundation, Hong Kong. I am grateful to Dr Janette Kwok for translating and summarizing papers in Chinese, Ms Jacqueline Yuen, who organized and performed blood collection from volunteers, Dr Daniel Fong, who helped with statistical analyses, and Drs Jonathan Sham and Peter Lee for useful discussions.